The Italians refer to them as “erborinati” or parsley green in reference to the dark veins that are the result of the cheesemaker mixing the curds with mold before the maturation process is allowed to begin. More commonly such cheeses are categorised as blue and one of the world's best is Italian, originating in the Lombardy region, taking its name, Gorgonzola, from the village that has now been devoured by the expanding metropolitan area of Milan. Monteblu originates from Val Chiusella in the Piedmont region, close to the well known ski destination of Val d'Aosta, and is produced using cow's milk with the addition of a little goat's milk. More enigmatic is the Castelmagno of Lombardy whose authenticity is protected by DOP or denominazione d'origine protetta regulations that specify it can only be made in one of three communes in the south-western province of Cuneo, namely Castelmagno, Pradleves and Monterosso Grana. Dating back beyond the 12th century, castelmagno is believed to have been produced originally as a currency to exchange for grazing rights to the land where the cow's milk used to make it, along with a little sheep's milk, is sourced to this day. It is something of an enigma in the field of blue cheese because while its rind very often displays a blue tinge, the paste within can often not contain any blue veins, natural ageing determining the individual characteristics of each wheel. There are two basic types, both made from cow's milk: dolce and piccante, produced under the watchful eye of a DOP in seven provinces of Piedmont and 10 of neighbouring Lombardy. Like many other cheeses, the sweet and more strong varieties are the result of different periods of ageing, in this case two months for the dolce, at least three for the piccante, the latter also exhibiting a more robust texture. The Galbani manufacturing group exports quantities of the dolce variety under the copyright dolcelatte, literally sweet milk, so named precisely because it was believed the shy and retiring palates of northern Europe were not able to handle the stronger, more traditional flavour. Piccante is produced using the curds from two separate milkings. The first is left overnight, the exposure to the atmosphere allowing for the natural development of mold before the second batch is added. Penicillin is then mixed in. After the wheels are formed and salted, they are punctured to allow the bacterium to flourish. 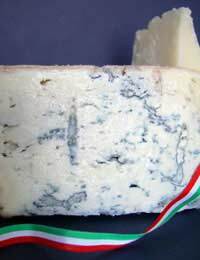 Both dolce and piccante are retailed in pre-packaged wedges as well as being available freshly cut from the round, the blue-orange hue of the rind contrasting with the milky white paste and blue veins within. While the sweeter variety can be enjoyed on its own, or accompanied by some crusty bread or biscotti, a slice of gorgonzola piccante, in common with its northern cousins, the castelmagno or monteblu, will benefit from a drizzle of honey to counterbalance the bitterness. A glass of a sturdy northern Italian red wine would not be out of place, either.